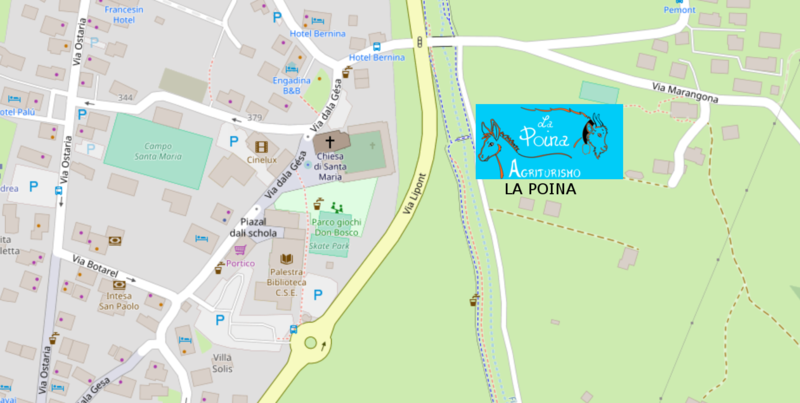 “La Poina” is easily accessible by car. From the Foscagno pass: follow the road until the first roundabout, where you take the first exit immediately on the right and follow the road that leads directly to our farmhouse. You will find it 750 metres further on, on the right. From the Forcola pass: cross the village following the main road as far as the traffic light near the church of Santa Maria, where you turn right and after a few metres turn right again, taking the small road on the left of the cycle track. Our farm is 150 meters ahead, on the left. From the Gallo Pass (Tunnel Munt la Schera): at the first roundabout in front of a church take the second exit, at the next roundabout take the third exit and continue straight on until you reach a crossroads with four traffic lights. Turn left and after a few meters turn right, taking the road on the left of the bike path. Our farm is 150 meters ahead, on the left. Several FREE AUTOBUS lines run throughout Livigno. The nearest stop is less than five minutes' walk away. A perfect vacation is waiting you! Contact us to ask more information. © Rights reserved to La Poina.